يسلط البحث الضوء على الدور الاجتماعي الذي تلعبه الأوقاف من خلال نموذج ما زال فاعلاً، هو العمارة العامرة في بيت المقدس. وينقسم البحث إلى أجزاء عدَّة، ويُعرّف بالوقف ومشروعيته، وتاريخه، ودور العثمانيين في المحافظة على الأوقاف، والدور الاجتماعي والاقتصادي والعلمي للأوقاف. في الجزء الثاني يُعرّف بصاحبة الوقف )خاصكي سلطان(، وموقع التكية، ويعطي وصفاً معمارياً لها. أما الثالث، فيعرض أهم الأوقاف الموقوفة عليها، والخدمات التي تقدِّّمها، وأهم الوظائف. ويخلص البحث إلى أنه لا بد من دعم التكية ودار الأيتام المجاورة لها للقيام بعملها، دعماً لصمود المقدسيين المرابطين في المدينة، إضافة إلى أهمية وجودها كمعلم أثري حضاري. The Primary aim of this article is to present the role of Charitable Foundations (Waqf) of al-Imara al-Amira in Jerusalem (Islamicjerusalem). It examines the meaning of Waqf in the Islamic Sharia, the role of the Ottomans in keeping and serving these foundations, and the role of Waqf in the social, economic and educational life in the 19th century. The second section gives a summary about the endower “Haseki Sultan”, describing the building (Al-Tekyeh) architecturally. While the third section discusses the main Awqaf endowed on the Tekyeh, its services, and employees. The article focuses on the role of the Tekyeh which still plays a supporting role to the people of Islamicjerusalem, as a charitable foundation; providing food, supporting the steadfastness and struggle against the Israeli Occupation, and keeping this archaeological and historical monument alive in the face of cultural, intellectual and religious invasion. ISNAD Qatanani, Abeer . 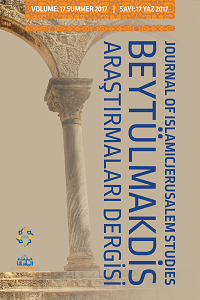 "The Charitable Foundation in the Ottoman Period: Al-Imara al-Amira in Islamicjerusalem and its impact on Social life". Journal of Islamicjerusalem Studies 17 / 1 (June 2017): 71-105.